It is about 9pm local time and I am calling you from Union Glacier base camp, close to the 80 degrees south of the continent of Antarctica. The tradition in Antarctica is the base goes on the local time from the area supported from so we will continue to be on the same time as Punta Arenas, Chile, while Vaughan and I are on this expedition. Of course it is not going to get dark, now we are on the continent of Antarctica; the sun is high overhead and it will stay there; the sky is a beautiful blue. Today was our scheduled day for departure to Antarctica and for once we left on our scheduled departure date. We got the call at our hotel quite early this morning and we were picked up at 10:30am. 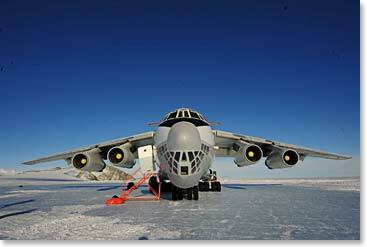 We were taken to Punta Arenas airport and a giant 4-engines Ilyushin 76 jet was being loaded. There was a 16 tons of cargo that went on the plane at this time; all the supply for the 50 odd staff that runs this camp, for various polar expeditions that are going on, for Vinson climbers of course. 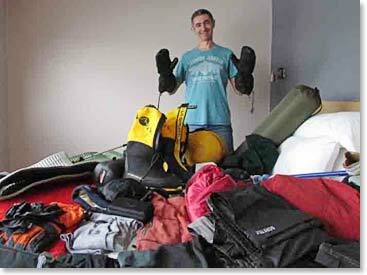 There is a lot of logistic and supplies that it takes for an operation like this. 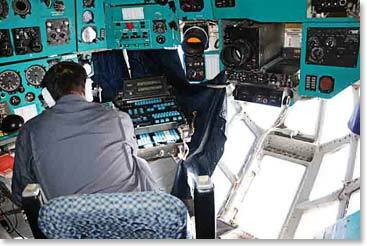 The Ilyushin flights are key; the Russian crew that has been doing that for a long time now. I believe that today was their 88th successful landing of the Ilyushin jet on the blue ice in either Patriot Hills or here at the Union Glacier. When Vaughan and I stepped off the Ilyushin along with the others scientists, polar travelers and Vinson climbers that we have flown south with, we were all stunned by the expanse and the scenery. It is an indescribable feeling to be in the interior of Antarctica. 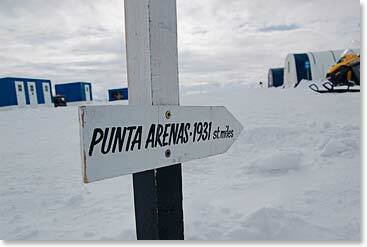 Now we are 600 nautical miles from the south pole, but as I said, we are nearly 80 degrees south. It is truly a polar experience; it is an awesome experience of the national world to just be standing here. Some of the Vinson climbers went off already this evening in the Twin Otters towards Vinson base camp. Vaughan and I were happy to stay here at the base in one of the very comfortable clams. 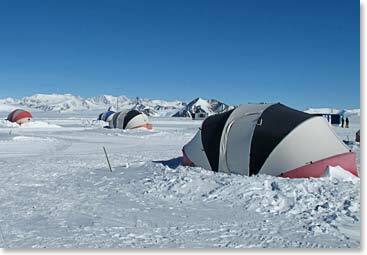 These clams shape polar shelters are pretty deluxe that we sleep in here; they are all named for famous polar explorers. Vaughan and I are sleeping in the one that is named for Admiral Byrd, the Byrd clam, and it is going to be a really cosy place to try to sleep. It will be light so we are going to have to put an eye shade to get some rest. We are still excited just to be here and it is really great luck to be off to such a great start on this Vinson expedition with no delays. 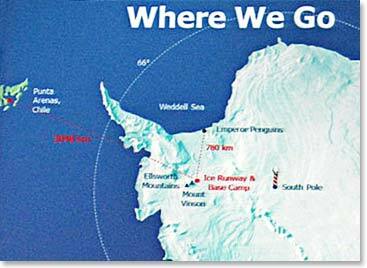 We are on the ice now, and we are under way and we are really happy to be in Antarctica. Berg Adventures deluxe facilities at the base, already set and waiting for our team, the Byrd clam.